With the help of Link Diagnosis, I’ve recently become intimate with link stalking. Erm, I mean, competitive backlink analysis. As my optimization hands are temporarily tied awaiting architectural and content management system revisions, external link building is the most useful way to bide my time. I was pleasantly surprised that Link Diagnosis had redesigned their service since the last time I visited them … a year ago September 2009. Sorry guys. This is for the rest of you who missed their grand transformation. Their “new” interface is sleek, easy to read, easy to export, and comes with a handy link strength score. And it’s still free! The data is pulled from Yahoo’s BOSS API, and will continue to be functional even after the Bing merger. The report strips out internal links, leaving you with the stalkable external links to review at your leisure. In essence, it’s like running a query through Yahoo Site Explorer with the filters set to “except from this domain” and “entire site,” but the interface makes it fat more pleasant and efficient to use than YSE. 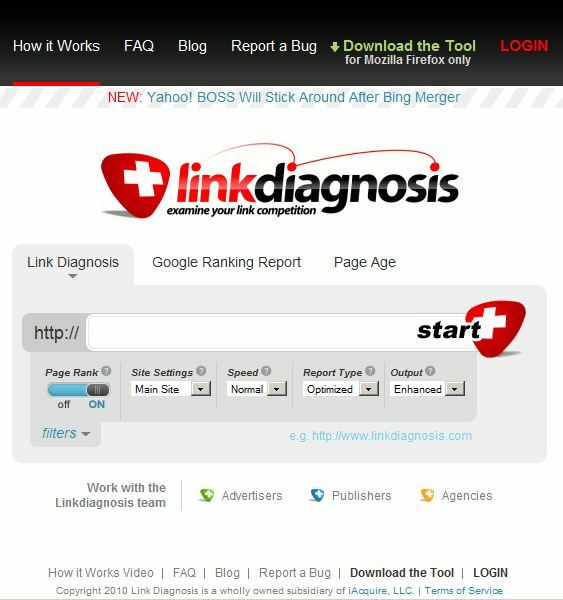 Unlike the former tool, Link Diagnosis now requires a FireFox plug in. You know the drill, click and install. The report will not run without it. Just head to their homepage and enter any URL. Click on the “Filters” tab below the large input field for a drop down with the report options. You can turn PageRank gathering on or off. I prefer it on: It’s slower but I like to have as much data as possible. The “Site Settings” option allows you to limit the report to a single URL or run the whole domain. Unfortunately there’s no folder option. It would be nice to get results for pages in a single category. The single page option is good for the most valuable pages on the site. Each run maxes out at 1,001 pages (Yahoo’s API limit), so if you really want to sleuth out the most links you’ll want to run the homepage and the high level pages on the site as well as the full domain. The next step is pretty straight forward: Click START. While the app runs, they kindly show their progress via a running log of activities with a tally of the various types of links discovered. The green “Continue Browsing” tab at the top opens another tab in FireFox for Link Diagnosis. You can surf on your merry way while your report runs in the other tab, or you can enter another URL to report on. Link Diagnosis cannot multitask to run multiple reports at once, but it will start the next automatically when the previous report has finished. The “Simple View” at bottom left just makes the viewing window smaller. Not sure what the value there is, since you can’t use the web page under the pop up app, but it’s there if you like that sort of thing. 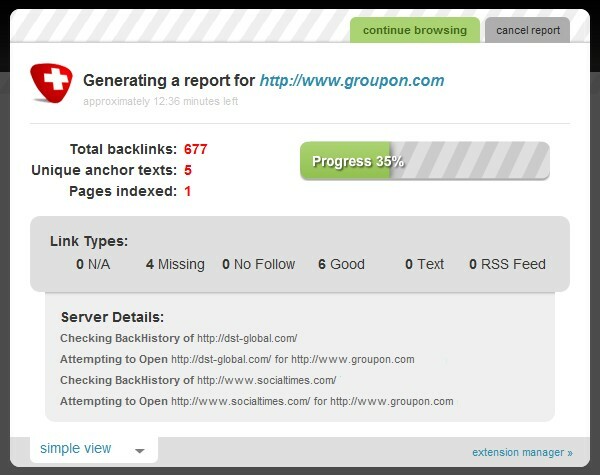 The report header has a summary of the number and type of links found. Link Type: Identifies whether the link was found on the linking page, and whether it was nofollowed. Outbound Links: The number of external links off the linking URL. Link Strength: A proprietary score that seems to be based on PageRank & the number of external links off the linking URL. Links To: Only available in the exported CSV file, displays the exact URL linked to. Very useful when the report has been run on the whole domain. The column headers in the online report allow for sorting, a nice feature for quick eyeballing. To save the report past the current session, log in and click the green “Save” button at the head of the report. When logged in, you’ll be able to view the report in the Extension Manager until you delete it. Clicking the “Share” button copies the unique URL of that report to your clipboard so that you can email it around without having to export it first. Here’s the sample report for Groupon.com I’ve been using for screenshots. Exporting to CSV is simple. Just click on “Export” at the head of the report. Choose which CSVversion you want save as you would any file. Open it up in your spreadsheet program of choice and start stalking. I prefer to merge the individual exports into a single large file for cross comparing competitors’ link profiles. By sorting on PageRank or Link Strength I can see which competitors have managed to grab unique juicy links from sources other competitor haven’t thought of. And by sorting alphabetically by linking URL I can see which competitors have links from common domains (a poor man’s Hubfinder). At the end of the day, competitive link analysis is not an ace in the hole. Acquiring the same links competitors have just gets a site on the same backlink playing field as its competitors. Link stalking is just one small tactic in the overall SEO playbook. And Link Diagnosis makes it easier, for free. Loving the new Link Diagnosis – thanks for the article! !